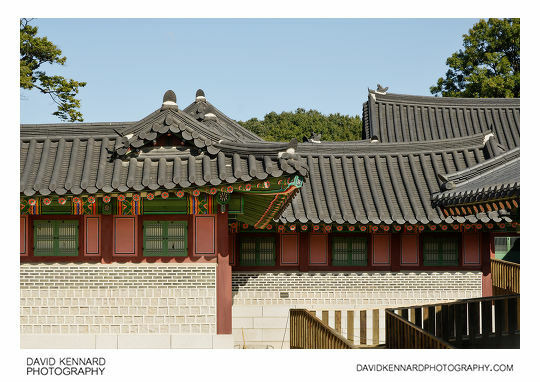 Changdeokgung is one the 5 Grand Palaces of the Joseon dynasty, and was built in Seoul in 1405 by King Taejong. 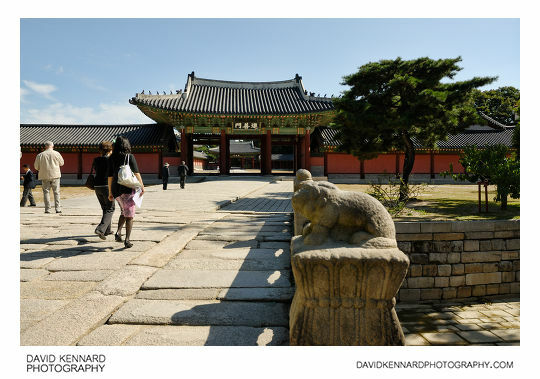 Although it was originally used a secondary palace to Gyeongbokgung, many kings used Changdeokgung as their residency, and later it became used as the main palace. Although parts of the palace were destroyed during the Japanese colonial period of Korea, since 1991 a restoration project has been underway to restore the palace. There is a famous detailed painting of the palace known as Donggwoldo, which along with other records has helped with restoring the palace to its previous state. On the day we visited Changdeokgung we were quite lucky in that it was a Thursday, when you can walk around the palace as you please. The other days of the week, except on Mondays when it is closed, you can only go on a guided tour. The non-guided tour is quite a bit more expensive, and of course you don't get a guide telling you about the palace. But it allows for taking lots of photos, which would be more difficult when with a tour group, especially if you wanted to set up a tripod and take 360 panoramas like I did. 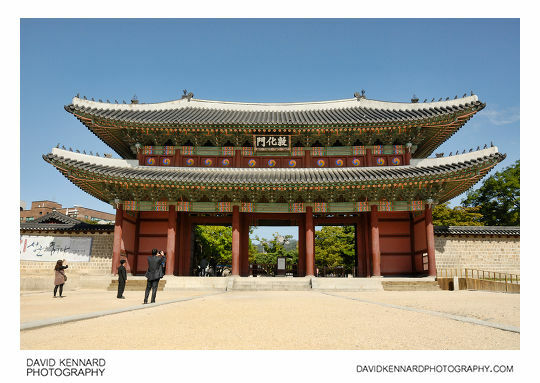 At the north end of Donhwamun-ro is Donhwamun (Hangeul: 돈화문; Hanja: 敦化門), the main gate of Changdeokgung palace. In front of the gate is a terrace that was previously covered with roads, but was restored to its current state in 1997. The gate was originally built in 1412, but the current building of Donhwamun dates from 1608 after the original was burned down. 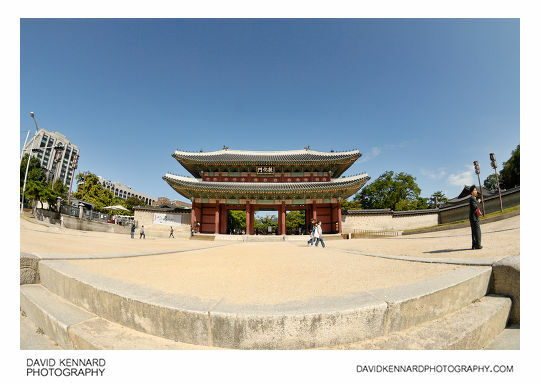 Rather than being built to the south of Changdeokgung's throne hall, Donhwamun is located at the south-east corner of the palace. This is because Jongmyo Royal Shrine had already been built to the south of the palace. Once inside the palace through Donhwamun, on the right is Geumcheon (Hangeul: 금천; Hanja: 錦川), a stream that runs down through the palace. A stream is something that every royal palace would have. Over the stream is Geumcheongyo (Hangeul: 금천교; Hanja: 錦川橋), a bridge that leads to Jinseonmun gate (Hangeul: 진선문; Hanja: 進善門) and the inner section of the palace. Looking north from just in front of Jinseonmun, is the southern edge of an area known as Gwolnaegaksa, where lots of government offices were located. Going in through Jinseonmun you come to a large courtyard area, where I stopped to take a panorama (you can view the 360 version here). 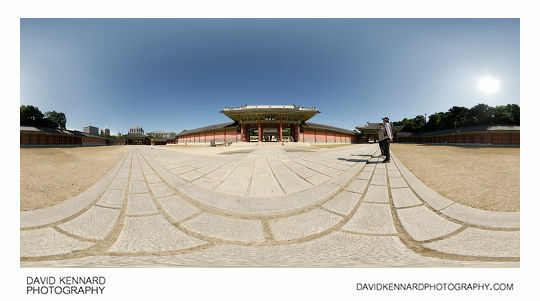 To the north is Injeongmun (Hangeul: 인정문; Hanja: 仁政門), which leads to the throne room of Changdeokgung. While to the right is Sukjangmun (Hangeul: 숙장문; Hanja: 肅章門), which leads to the royal residencies in the east of the palace.